I’m sorry Mr King, but you just said what? Q. Is Sam Hornish Jr. going to leave the IndyCar Series to drive stock cars in 2008? A. No. And here's why. Sam really loves four things: his wife Crystal, his family, Northwest Ohio and racing. Sam and Crystal are expecting their first child Feb. 10. If you think that Sam would leave Crystal to drive a race car in late January or early February, then allow me to laugh out loud. Sam and Crystal would be miserable if they had to move to North Carolina, away from their respective families (in fact, I'm not sure they would ever consider moving, which would make the stock car scenario pretty tough to pull off). Sam still has some mountains to climb in the IndyCar Series. 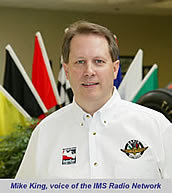 He is regarded as the oval meister, but unlike his mentor, Rick Mears, Sam has yet to master a road or street course. Lastly, money will not be the determining factor in the decision. Make no mistake, 2007 has been tough on Sam. He has had to deal with a bumper crop of bad breaks and many drivers that I've talked to say Sam's reaction time has been negatively affected by the time he's spent trying to adapt to racing a 3,400-pound stock car. My prediction? Sam Hornish Jr. returns to the IndyCar Series next season loaded for bear with, not one, but two teammates: Helio Castroneves and Ryan Briscoe. Three Team Penske drivers? That’s a bold statement, but then this was just as bold. Ahem. huh. we'll see. sure looks like sam is going to bolt. if not, I'm not sure why he's taking the Car of Tomarrah rides. It will be, as they say, interesting to see what happens. Sam is seriously gawn (sic) pending the sponsorship announcements and contracts. I won't presume to speak for the entire "racing world", but it would seem many are excited for Helio, think the exposure is good for the league, definitely think he should have some fun with the show...but many of us are annoyed that racing announcers for ABC/ESPN seem bent on hyping the show every chance they get. I've got a few recent posts on the subject, so you can read all of the comments yourself. Just search for "dancing" and they should pop up. I can't imagine that word gets used much otherwise around here. Crystal balls? Waterford or Kosta Boda? Wait, wait - that's just TMI. As for the Sam saga...make an announcement already! Maybe Sam's secretly enjoying all the focus on him... LOL!